Would you look at this? A new post only a week later! I think I'm starting to get the hang of this. I think I'm just too excited not to share all of the fun adventures I've had in the world of cosplay. And I can't wait to go on more very soon so that I can keep you all in the loop! In the last post we looked at sewing, and the construction of the Monk cosplay. In this post we'll be exploring the accessories (and prop). In the final post, we'll look at how to bring it all together by transforming into a Panda, and getting ready for the event. These were super fun to make. We had to be creative because we couldn't find buttons that were exactly the right size. Not only that, they had leaf adornments that had to be custom made. As you can see in the picture above, the center claps are made of three parts: two leaves on each side, the silver thread/rope, and the center button. Because we were working as a team, the three of us set out to find buttons that matched that center piece. We couldn't find any, so we made our own! 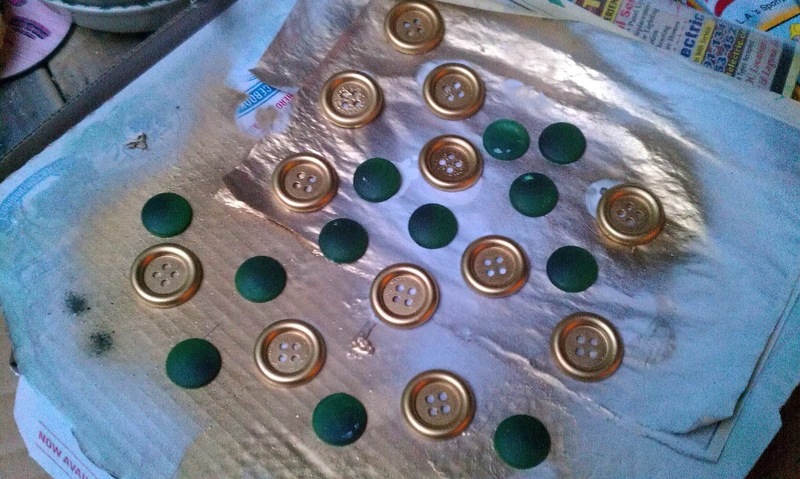 We took normal, white buttons that were large, and painted them gold. We then tried to find a button that would fit in the center, but kept running up dry. Randomly, we found googly eyes that were the perfect size. So we just painted over these, glued them on, and glossed up the whole thing. They ended up coming out perfect! After that, we moved on to making the side leaves. These were made out of a thick foam. We did it in two layers - one base layer being the green leaf. The second layer was gold, and cut out to form the edge that we laid directly on top of the green. This created the layered, 3D effect of a button/attachment. With our three buttons made, we laid them out against the sewn tops, measured them, and cut/attached the grey rope with glue. This took some time to ensure the rope would stay. After the clasps were done drying, we cut out small bits of velcro that we glued/attached to the backs of the two end buttons. We again measured them against the chest piece, and attached their opposite sides to the shirt. This way, the clasps could be easily put on and removed (since we put on the top with a zipper). This is great because we can wash the pieces without worrying about the buttons. I learned many of the techniques used here from Volde, one of my fellow cosplayers. 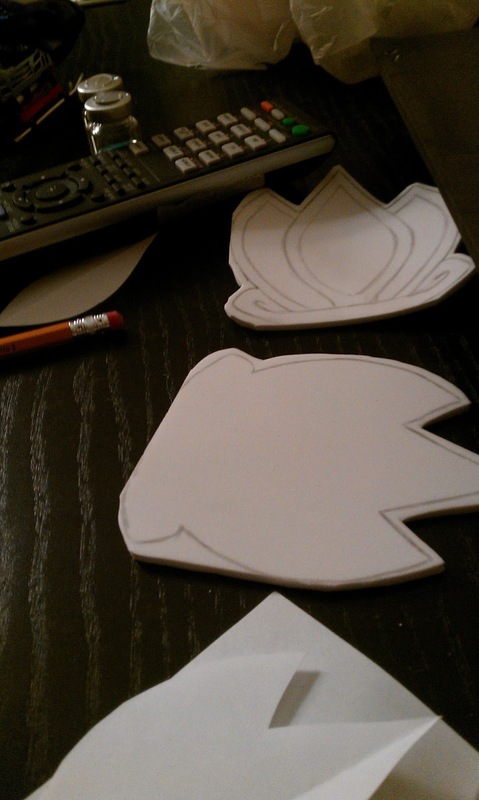 I had never really made armor before so she taught me some cool foam tricks. We decided to make the wrist armor out of foam so it was light-weight and easy to pose in. We started out by cutting out pieces the circumference of our wrists, and then covering that with a black fabric that we sewed on like a tube. We sealed the end with velcro, so the wrist strap could be easily put on and removed. We then started working on the actual design of the armor. This, too, was made out of foam. Similar to the buttons, we layered the foam to give it its 3D look. 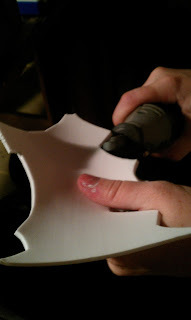 Using the pattern to cut the foam. In order to ensure the armor matched, we made a little pattern out of a thick card stock, and traced this into the foam. We were then able to cut out similar pieces. This also made sure that the gold layer would fit perfectly on top of the green layer. 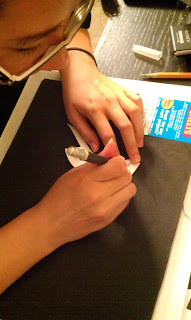 After the pattern was drawn on, we began cutting. 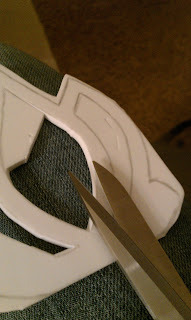 This process takes a while, as foam is fickle and easily indented. So we took our time cutting everything out carefully. Cutting out the gold layer. 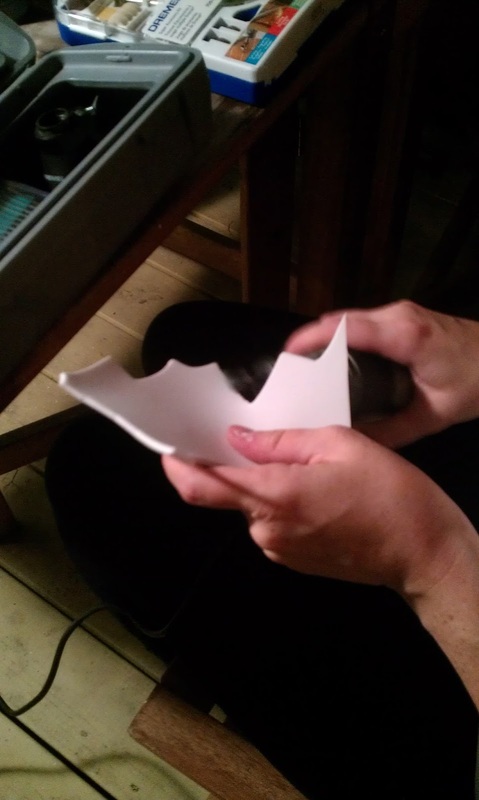 After everything was cut, we used a special took to file down the edges. There are several ways to do this (exacto knife, scissors, or a beveling tool). This allowed for the armor to have a more blended 3D shape, instead of just the harsh edges of two layers. 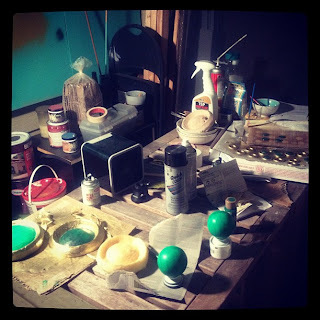 Once the foam pieces were properly smoothed and ready to go, we painted them and then attached them with hot glue. Then the armor was attached to the wrist piece, and then it was all set! We really lucked out on the belt for this one. One of the girls cosplaying with our group, her father, had connections with some cool fabric and fabric adornments. Through him, we were able to get these curtain dangles that closely resembled that of the red rope that the Monk's use for their belt. If we didn't have this connection, we were considering buying several yards of a thick red rope, and braiding or twisting it together to get a similar effect. Then, you can purchase tassels or something similar from a fabric or home decorating store. The only thing left after that was the belt buckle. This was a tricky part, as we could have made it a normal belt buckle size. But we really wanted to make them large and give it that WoW-touch. We purchased large foam disks that we were going to carve, and then smooth out and paint - as this would be very light. But then we decided to try out resin molds. This ended up working out really well. The resin belt buckles with paint. We carved the mold, set the resin, and then made all three! 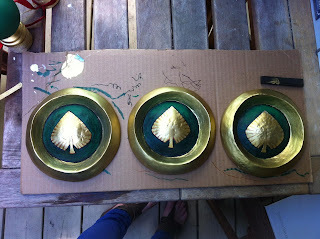 After the resin was dry and ready to go, we painted them and added the leaf detail in the center. Much of the resin work, and art details, are thanks to Volde and her boyfriend (who is an artistic genius). I'm really looking forward to playing with resin more, as these turned out great. 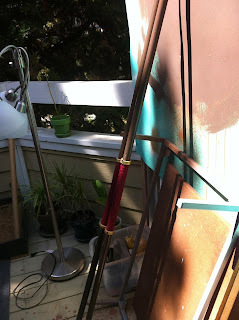 On the back, we attached wire hooks that we threaded the red rope through. The wire hooks were similar to that of a purse clasp, or a pinch-hook. This allowed us to remove the belt buckle, and then take off the belt. Overall the resin was a tad heavy, and pulled on the belt. We were hoping to find an alternative to keep the rope tighter with the belt buckle for the future. Our final accessory was the staff. While we didn't want to make the standard staff that the Monk's start out with, we decided to be creative and make something of our own. We wanted it to be based off of the Monk design, yet a little simpler. So we picked up some PVC pipe and cut it to the correct length. We put a cover on the bottom so that it was easy to place down. From there, we painted it brown. To make it more like a weapon-staff, we added the center area where the Monk would hold the staff. We did this by gluing on a patterned felt, and then creating small, foam rings to line this. After that, we decided to have fun with the top of the staff. 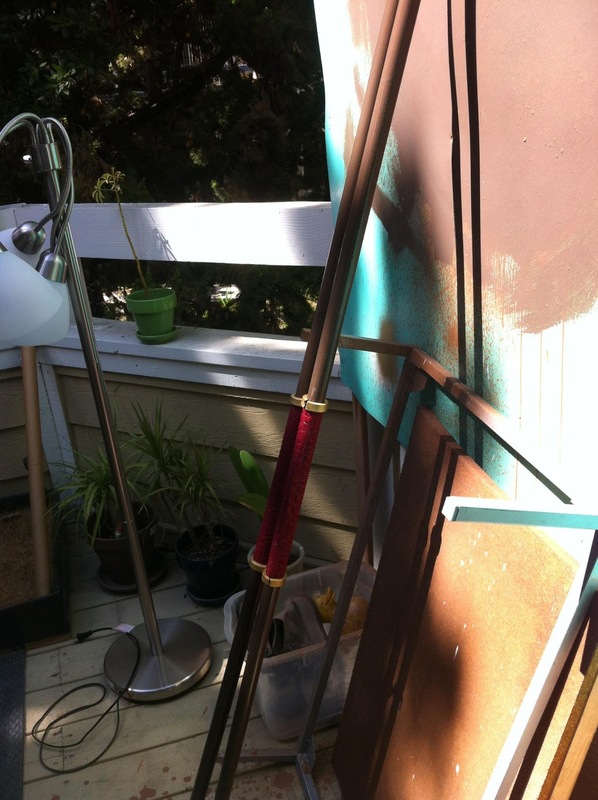 Volde and I found some cool curtain rod toppers that we thought would be fun. We painted these green and gold, and then attached ribbons and bells and other interesting looking gems. We wanted our staves to make a bit of noise. 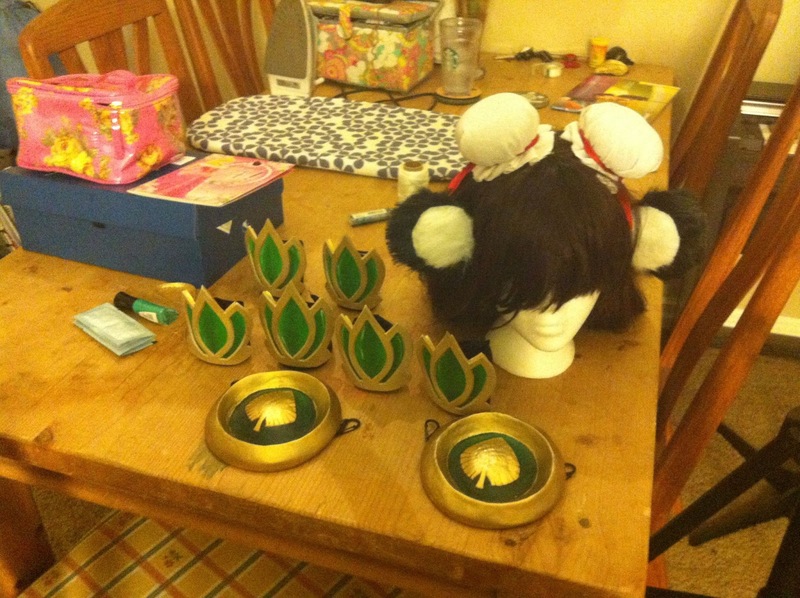 This about wraps up our accessories for the cosplay! If you have any questions, feel free to leave them down below. Again, I worked with two other lovely ladies to create these costumes and we did our best to bring our creative juices to the table! I couldn't have done it without them. Many thanks to those girls for all of their help. Stay tuned for the next, and final installment of the Pandaren Monk!